Say goodbye to distraction with the MDR-ZX110NC Noise Canceling Headphones. Featuring a 12 thru 22,000 Hz frequency response for pristine bass, mids, and treble, these lightweight headphones reduce ambient noise by 95%, so all you?ll hear is the music. Plus, you can listen for longer with 80 hours of battery life. 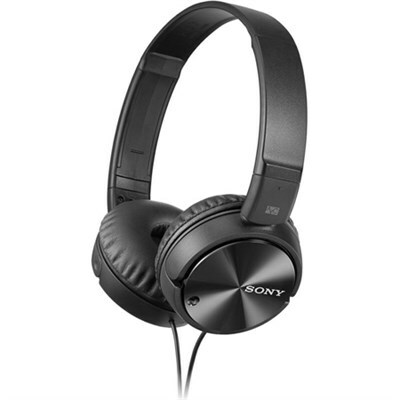 Perfect for life on the go, these headphones deliver remarkable, noise-free audio experience. While the pressure-relieving ear cushions provide long-term comfort, the swiveling earcups fold compact for portability. Thanks to Sony signal processing technology, ambient noise from the office, airplanes and trains is reduced by up to 95 percent. 30mm driver units deliver full, balanced sound for a complete listening experience from 10-22,000 Hz. High-energy 300kJ/m neodymium magnets facilitate the deliver of rich, powerful sound with deep bass and clear highs-just right for today's popular music genres.